As real estate agents, we live to serve and at the heart of our service is building wonderful, lasting relationships. And so, we’d like to invite you behind-the-scenes with Kristin Weiner. 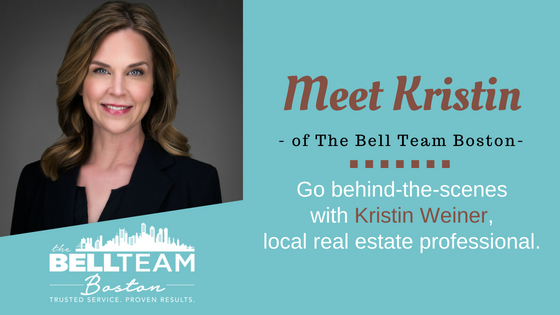 Here you’ll get to know her better, because while she works her magic for real estate clients there’s so much more to Kristin than just business. On the lighter side of life, Kristin and her husband, Chris, fancied becoming doggie parents. Chris decided he wanted a dog and so began the search to learn all about masculine dogs. But, little did he know what was in the works for he and Kristin. As it turns out, Chris worked with a colleague whose parents are doggie fosters. Naturally, rescuing a pup became a topic of conversation… how rewarding it is, possible challenges, making family memories, etc. Well lo and behold, a new rescue was going to be fostered because she was just too young to be cared for at the local Humane Society. And so, Belichick was rescued and fostered until it was time to head off to the Humane Society. But wait, Belichick was a girl! Now Bella for short, she was about to start the next chapter of her life… “society life”, or so we thought. Kristin and Chris saw a picture of Bella and without even meeting her they fell in love! The day she was to join the ranks at the Human Society her new adoptive parents rescued her at opening time before she even made it through the front door. The couple love their furever daughter to pieces and can’t imagine life without her. As you can tell, family is very important to Kristin and so this next part is dedicated to Papa (aka Marvin Williams), who says he swears her first words were “Go Dawgs.” Papa’s definitely the reason she loves football… and real estate. He started years ago by helping establish brand new neighborhoods in places like Peachtree City and Newnan. Papa instilled a diligence and passion for excellent customer service in Kristin, and he’s still in real estate today. But, right in Needham are some her favorite places. If you haven’t been by the cupcake shop, Treat, you’re missing out. Kristin loves this place and enjoys some very tasty gluten-free, vegan friendly treats at Treat when she can. She also has a favorite pizza shop: Hearth. You might see her grabbing a slice of her pie of choice, meat lovers. But, who would Kristin be without her Iced Americano? “The blacker the better,” she says. Hit us up on Facebook and let us know, what’s your favorite cup of joe? Is the Greater Boston housing marketing showing signs of change?